Embedded YouTube videos of humans trying to introduce rats to rats. WARNING: Many of these videos have problems, they are examples of what NOT to do. Many people believe allowing rats to be mildly or even intensely aggressive is "normal." Please do not follow this approach. 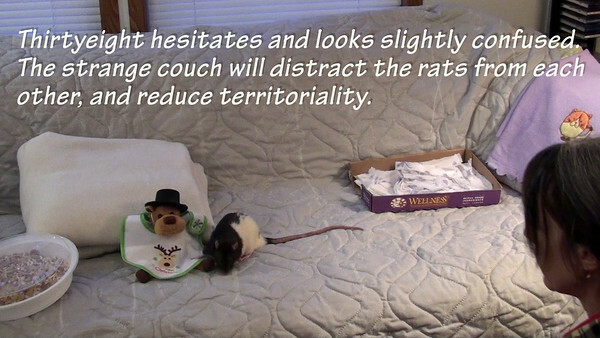 Rats naturally defend their territory and do not allow strangers into their mischief. Encouraging aggression may result in MORE aggression which will be even harder to eliminate, and the rats may become traumatized as well. Before you watch a video, read the comment first, so you can anticipate whether you will see a good introduction, or a dangerous one. Some of these are hard to watch. Here are four young rats wrestling their hearts out in very normal fashion. Lots of kicking action, pouncing, flipping, side-kicking, laying-on-top-of, pinning, and general all-around social bonding. Actually, let's view some good rat-rat grooming. Not my rats, but Rapunzel grooms Chailyn in two snapshots in the first part of this video. If you hang in there for the full video, you can see the human groom Chailyn, and Rapunzel groom the human, too. Mutual grooming, that's essential to full rat socialization. Onto problem intros. I have a hard time watching this because I do not like the level of aggression going on between these two boys being introduced to each other. Please, intervene to prevent this kind of aggression - check out the "glove rat" video for help. In this example, the owner acknowledged the introduction was not successful. These rats are too aggressive to me. The level of poofiness is high. The cage is too small, there are too many rats, their aggression is too high. This has some screaming so be prepared. The owner doesn't indicate if the introductions were ultimately successful: "Introducing the 11-month old Kapteinen to my youngsters. Starring Kapteinen, Benny and Snooch (approximately 3 months old) and Pest, Kolera, Listeria, Lepra, Salmonella and Tulla (approx 5 weeks old). Kapteinen has met Benny and Snooch before over the past week. (I only got him about a week ago, as a semi-rescue.) It's been going rather well in my opinion. Snooch screams a bit but there's no blood, and I hope they'll all get along in the great big Palace in a few days." This shows behaviors more appropriate to introductions going well, and yes, such behaviors can include boxing, stand-offs, sidling, cow-kicking, flipping, squeaking, bouncing, and pouncing. This human does not explain what other intro techniques, if any, have been used prior to this point, but I think this may not be the first time the rats have met. Perhaps they've had cage-swapping, etc. There is also no note as to whether these intros were successful. The human isn't following them around carefully with a gloved hand to prevent serious aggressive behaviors. Perhaps she had enough prior work to know they had advanced beyond that, or perhaps she doesn't know that one rat can slice open another rat, or the human, faster than a human can blink. It is so important to do to rat-rat introductions right, here's the "glove rat" video which can also be found in the Techniques to Introduce Rats gallery on JoinRats. The owner comments, "Morat rat is bullying poor Reggie and casts a terrible paralysing curse on him! Don't worry, he isn't really dead." While Reggie becomes immobilized for what seems like a very long time, this is still in the range of normal. 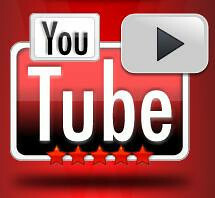 Embedded Youtube videos - Rat-Rat Introductions. If you are viewing this on the Keyword page, click the link below and visit several pages of embedded youtube videos of good and problem rat-rat introductions. Use them to insure you don't make mistakes introducing your rats to rats, because serious injury to rats and humans can result.